Greg Lewis is a silversmith who excels at creating fine American Indian jewelry in the traditional style. Often, when looking at his work, you could almost swear that it is actually a historic piece. This is because Greg is at least the 3rd generation of jewelers carrying on the time-honored traditions and techniques that have been handed down through his family. 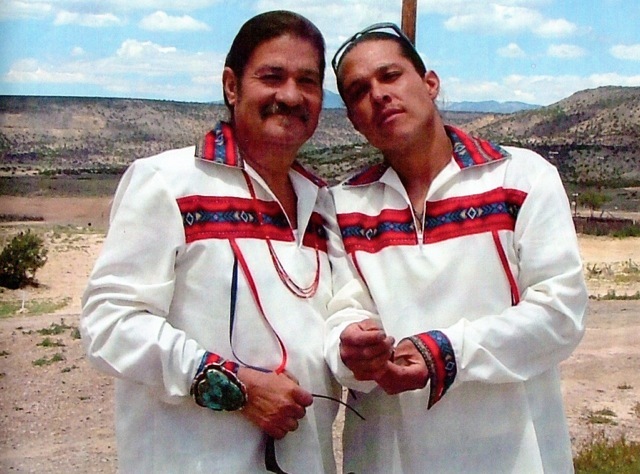 Greg Lewis began working with silver when he was just 15 by studying with his paternal grandfather, Alvin Concho Lewis of Acoma. So much influence comes from Greg’s grandfather including his Arrowhead hallmark, which Alvin first established in 1922. It is said that this arrowhead hallmark came to Greg’s grandfather from a birthmark on his right leg that had a similar shape. Like his grandfather before him, almost everything that Greg Lewis does is by hand including most of his tools, which he creates out of old files and tool steel bar. All of his stamps are handmade too – either by Greg or passed down from his grandfather. Even the fine natural turquoise that Greg Lewis often sets in jewelry is hand-cut and hand-set. In fact, only Greg's torch and buffing wheel are modern – a true testament to the level of workmanship in every unique piece that Greg Lewis makes. Consider, if you will, this silver frog box by Greg Lewis. The entire box is made by hand from the heavily stamped bezel that holds the Teddie Weahkee frog fetish to the hinges that open perfectly to the 12 repousse flowers that adorn the surface to the four silver tadpoles that are carefully shaped and appliqued onto the box. No detail has been left untouched. This is the kind of quality that we’ve come to expect only from the old masters, and it is refreshing to see it continuing today. It is a painstaking and time-consuming process, but the end result is an exquisite legacy to the silversmiths that came before Greg Lewis. It is a legacy that is continuing through Greg Lewis as his son, Dyaami, began his own apprenticeship at the age of 8. One look at Dyaami’s silver and turquoise bug pin is all you need to see that he is quite skilled in his own right. Now a master silversmith, Dyaami will teach his two sons, Lorenzo and Estevan, so they can carry on the tradition to future generations. Considering the high quality jewelry that Greg and Dyaami create, it is unbelievably affordable. Only $165 for this silver cross pendant by Greg Lewis, and only $375 for this amazingly beautiful butterfly pin or pendant. I have a hard time thinking of any artist that creates such magnificent yet affordable old-style work. I hope you get to know Greg Lewis better. His work is so pleasing!